Serendipity. A good gift, seemingly by accident. Some would say coincidence. Others would say there is no such thing as coincidence. But a good gift, none-the-less lucky. We often find serendipity when we write. Brevity taught me about nines: I can evoke a creative idea at 99 words. This accidental discovery that word constraints turn my mind to flint that sparks promising impressions, I learned from poets. Yet, longevity also offered a gift of nines. When I attempted the National Novel Writing Month challenge, I had to write an average of 1700 words a day every day in the month of November. What I discovered by happenstance is that I struggle with flow up until word 999. Then it breaks loose and I’m a writing cannon-ball. You’re a writer. Write. While I do agree that writers need time for processing, day-dreaming and contemplating, we have to practice craft consistently. Free-write, journal or blog to limber up. If you write books, you have to write pages. If you write poems, you have to write verses. If you write blogs, you have to write posts. To achieve the finished product you have to write. And in writing, you’ll discover gifts. Allow for imperfection. I groan at my younger self as a writer. I was such a picky perfectionist that I’d write and re-write the first paragraph so many times it was like shoveling with a hoe–unproductive. Usually the pressure of a deadline would force me to break out of that perfectionist cycle. Later, I discovered that the magic of my writing happens unedited. Oh, it needs editing, but after I write, not during. It’s okay to break rules. It’s okay to make mistakes. It’s okay to write it differently than planned. It all leads to discovery and therein lies the gift. Show up. You have to go places to get places. When knocking on one door, the neighbor may answer his and have a gift for you. Take Bob Hoskins, British actor who died today at the age of 71. According to NPR reporter, Bob Mondello, Hoskins’ career was the result of serendipity: “Hoskins got his first acting gig, at 26, by accident: He went with a friend to an audition, just to keep him company, got a script shoved into his hand by someone who said “you’re next,” and decided to give it a shot.” Be alert for those chance encounters. Seek connections. Life has a way of weaving patterns even if we think we are following divergent threads. I grew up near wilderness with an eye for the natural world. In college learned nature writing. In my career I wrote farm profiles for the natural food industry. My daughter went to Baffin Island on a cultural exchange, giving me the chance to meet Will Steger which led me to learn about global warming and how it’s impacting the Inuit communities. Last November, I wrote my second novel project, “Warm Like Melting Ice” about a climatologist on Baffin Island. Just yesterday I found out that there is an actual genre called, cli-fi, that fits this novel like an Arctic mitten. Thank you, Anne Goodwin, for writing a flash cli-fi that led to this discovery. Suddenly, a lifetime of threads connected to reveal a tapestry. Dare to leap. Reading a post on Diane Mott’s blog, Being Truly Present, I related to her struggle to take off the training wheels. Two years ago I left my career in marketing communications to finish my first novel. I picked up client work writing content, reports and editing. As I built my writing presence online, I leaned heavily on my career writing to qualify myself as a writer. I felt that I was somehow less of a writer if I focused on literary pursuits, yet that is what I want to do. Yesterday, I re-branded my social media. I dared to leap. I dared to call myself a writer without having to focus on business or consulting. The training wheels came off. How will you dare to leap? Serendipity can (and will) happen with your participation. You may set out to write one thing, but publish another. You may find an idea in flash that becomes a novel or you may take an idea for a novel and create brilliant flash. You can use the flash fiction challenge to explore, to compile material for longer prose, to invent new possibilities. You can submit your flash fiction and see what doors it might open for you. Flash Fiction Magazine accepts submissions of 100-word stories–that’s near serendipitous to us writing 99-words! This week, let’s take off the training wheels. You can leap as a writer and try something out of the ordinary for you or your character. What scares you? What scares your character? What lines of safety need crossing? Think about that moment when the screw-driver comes out (Mott’s terrific analogy). It could be exhilarating, terrifying or sobering. I think about yesterday, when I deleted my Facebook “business consultant” page and reloaded it as an “arts/humanities” page. My mouse arrow hovered over the save button. Screw-driver quivered. Training wheels came off. And I haven’t crashed yet (she says on Day Two). April 30, 2014 prompt: In 99 words (no more, no less) write about the experience of letting go of something that feels safe like training wheels. Respond by noon (PST) Tuesday, May 6 to be included in the compilation. My contribution is a reconstructed passage from my cli-fi novel in progress. It was a fun exercise to make flash from a scene. May you find an unexpected gift this week through your writing! By Charli Mills in Flash Fiction Challenge on May 1, 2014 . Those last three words are like shears. You’ve packed so much into this brief scene–the setting, the era, the dilemma and the resolution. We’ll have to think about the meaning of hair and it’s connection to clinging to fears and letting go. Thanks for another great response! Your focus strengthened at the end when you cut out transitions and used dialogue. Both the expository and the dialogue worked well together. I love the matter-of-fact question “And how will that be different?” that enables the realisation to occur. Sometimes it can be the simplest thing that sparks a monumental discovery/response. You have captured that moment. Great post, Charli. Just to add another stage to the part of serendipity of which I’ve been part, because of those links I’ve now discovered you’re writing a climate change novel, which sounds intriguing. I love the way these links take us to places we’d never expect. Impressed with yours and Paula’s contributions so far – so interesting they are both about hair! Not sure what I’ll make of it yet, if anything, but thanks for the prompt. Thanks, Ann. I think when we stay within the bounds of what’s familiar, we get more of the same. But when we follow the links into the unfamiliar, we discover those unexpected places, as you say. In some ways, we become treasure hunters! Thanks for pedaling over here! Discussions help us digest information, broaden points of view and go out and write (draw) some more. I’m learning to love the process as much as the end product. It helps me realize the joys in being present with creativity and that serendipitous flow that ensues. I appreciate the encouragement! Ditto about hair, and about Charli’s removal of the training wheels. And a wonderful response, Ruchira! It’s an inner story and told well. Thanks for joining this week! Powerful piece! The tension between the idea of the dressed bird and what is necessary to bring it to plate rings true. It makes the final action one of intentional bravery. Thanks for joining us! There’s a truth in this story that isn’t told when we cruise the supermarket aisles. I wonder how different our eating habits might be if this was our daily task. Welcome Geoff! You did a splendid job with the 99 word limit. I laughed and cringed at the same time. Even with the word constraint you captured that universal youth awkwardness we feel when around the person we like. The dog caries out an important role! I hope you return weekly and find that flash writing has gifts to offer when practiced regularly. Thank you! And the preference is yours, Geoff. On Tuesdays I compile all the flash into one post so that they are easy for readers to access without having to hop around. I post each individual story on Carrot Ranch Communications (Facebook page) and gladly include links back to your own blog. Whether you want to post the response in the comments or on your blog depends. 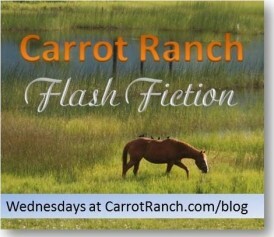 Some people have a specific agenda with their blog and flash fiction might not fit. Other bloggers write about their experiences or processes and include their responses. It’s up to you! Love your piece. It’s all in the timing, isn’t it? I also laughed and cringed as I read the story. I can just imagine it happening. I do like it when I can read flash pieces on the author’s blog, so I can check out what else they are writing and leave an individual comment. Though, as Charli says, that doesn’t suit all writers. Just a thought. I like that you spoke from the reader’s perspective, too, Norah! Helps us all navigate what works! Ha! This is fantastic! Absolutely love the last line. Welcome Larry! This made me think of the “Old Red Rooster” my husband owned for 20 years. By the time she was done, I thought I was happy to see her go, but the truth of your last line makes me realize she will always be our best-ever pickup truck. Great flash, but of course I would expect that from a seasoned flash writer. I want to let our readers and writers know who you are–this is Larry LaForge of Flash Fiction Magazine (as mentioned in the April 30th post). A gift indeed that you stopped by to join us! I hope to see more of our writers submitting to your magazine (already I read a great short by Anne Goodwin) and I look forward to you joining us as you can. Thank you! What a creative take on the prompt this week! My fill in the blank response is “baseball.” It’s so interesting to see the turn-out each week and read all the response again in one piece. I agree. There is a great variety in this week’s responses. Thanks for sharing your response to mine! I haven’t tried baseball but used to play softball at school.